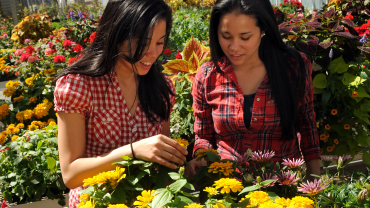 The Horticulture Science Graduate Certificate is an individually designed program in horticultural science. To earn your graduate certificate, you need to complete 15 credit hours. No thesis or dissertation is required. Courses are taught via the web and at two-way video-conferencing sites around the state, so you won’t need time off from work or face long commutes to campus. Each student is assigned an advisor and consults with the advisor to design his or her program. Because of the diversity of subject matter and learner interest, students may concentrate in such areas as general horticulture, food horticulture, and ornamental horticulture, and may also include a limited number of courses from other academic areas within agriculture. Participants must hold a bachelor’s degree to enroll in this program. Online Horticulture Certificate applicants should have majored in horticulture, crop science, plant science, or agricultural education with a concentration in plant science, or another closely related degree. Students may begin taking courses for the certificate in Summer, Fall, or Spring. All certificate coursework must be completed within four years of enrollment. Five courses (15 credit hours) are required. The student and his/her advisor will select the courses that will constitute the student's certificate requirements. At least three courses in the certificate must be from the Department of Horticultural Science. The remaining two courses may also be in Horticultural Science, or from one of the following areas: Agricultural and Resource Economics, Agricultural and Extension Education, Biological and Agricultural Engineering, Crop Science, Entomology, Food Science, Plant Pathology, and Soil Science. Note that not all courses are offered each semester. Up to twelve (12) credit hours of courses taken while the student is classified as a Post-Baccalaureate Studies (PBS) student may be used in the certificate program if approved by the student’s advisor. Below is a list of courses that may be taken as part of the certificate program. Permaculture means "permanent culture," and ..."is the conscious design and maintenance of cultivated ecosystems that have the diversity, stability, and resilience of a natural ecosystem." [Bill Mollison] This course will explore a design/thinking methodology that seeks to provide our essential physical needs, food, water, shelter, energy, etc., while doing so in an environmentally friendly, sustainable manner. The three weekend field trips are required. This course is restricted to upper level undergraduate, graduate, or matriculated continuing education students. STUDENTS MAY NOT RECEIVE CREDIT FOR BOTH HS 432 AND HS 532. Overview of plant breeding methods for advanced undergraduate and beginning graduate students. Covers principles and concepts of inheritance, germplasm resources, pollen control, measurement of genetic variances, and heterosis. Special topics include heritability, genotype-environment interaction, disease resistance, and polyploidy. In-depth coverage on methods for breeding cross-pollinated and self-pollinated crops. 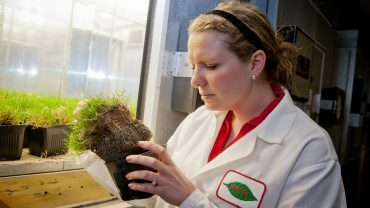 Prepares students for advanced plant breeding courses. The course focuses on the impacts of the nursery industry on the environment and environmentally sound nursery practices. Exploration of the major challenges facing the nursery industry that drive decision making during production. Evaluation of past and current research addressing these challenges and sampling procedures and interpretation will be learned. Graduate status and an undergraduate nursery production or management course or working knowledge of nursery production required. Preharvest and postharvest factors that affect market quality of horticultural commodities with an emphasis on technologies to preserve postharvest quality and extend storage life of fruits, vegetables and ornamentals. Principles and problems associated with breeding clonally propagated crops and techniques used in overcoming these problems. Taught third five weeks of semester. Drop date is by last day of 3rd week of minicourse. Theories of plant senescence, both physiological and biochemical, and postharvest changes in all types of plant parts. Emphasis on physiological principles underlying current postharvest handling and storage techniques. A study of fruit development from fruit set to senescence. Taught third five weeks of semester. Drop date is by last day of 3rd week of minicourse. 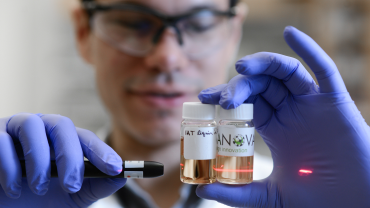 Physiology of plant responses to environmental stresses, with emphasis on current research in selected physiological, molecular, and biochemical mechanisms for tolerance to environmental stresses such as temperature extremes, drought, salt, pathogens and other plants. Chemical, physiological and biochemical actions of herbicides in plants including uptake, translocation, metabolism and mechanism of action.